Head north of America and you’ll quickly discover a land of opportunities that tends to lean on the side of having adventures in the great outdoors rather than making it big in the city. 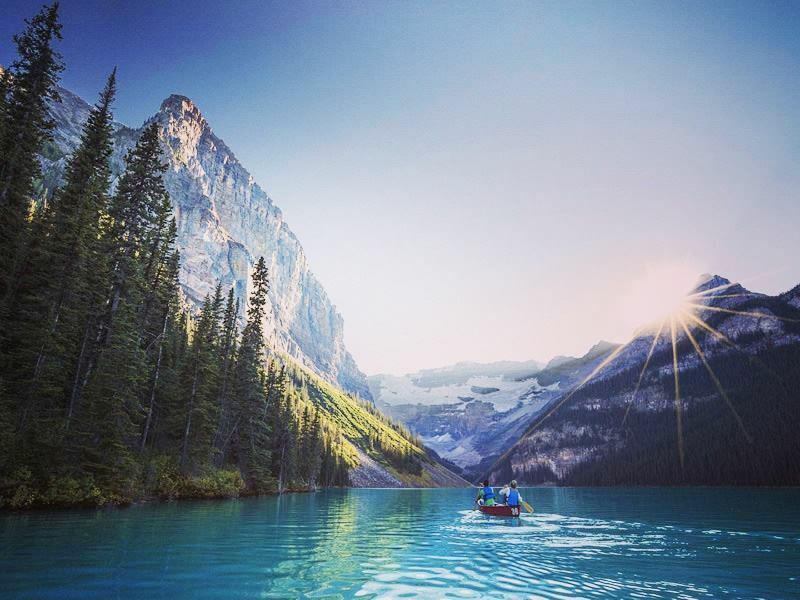 Canada is an absolutely amazing place and anyone who’s into trekking, biking, skiing or boarding need look no further than any one of the country’s 36 national parks which are just brimming over with natural beauty and awesome outdoor activities. Aside from the ascents and descents, Canada is also world-famous for its lakes with five, in particular (Erie, Superior, Huron, Ontario and Michigan), making up what is commonly known as the country’s Great Lakes system. This is the world’s largest series of interconnected fresh water lakes occupying just over 20% of the planet’s fresh surface water – around 95,000 square miles. 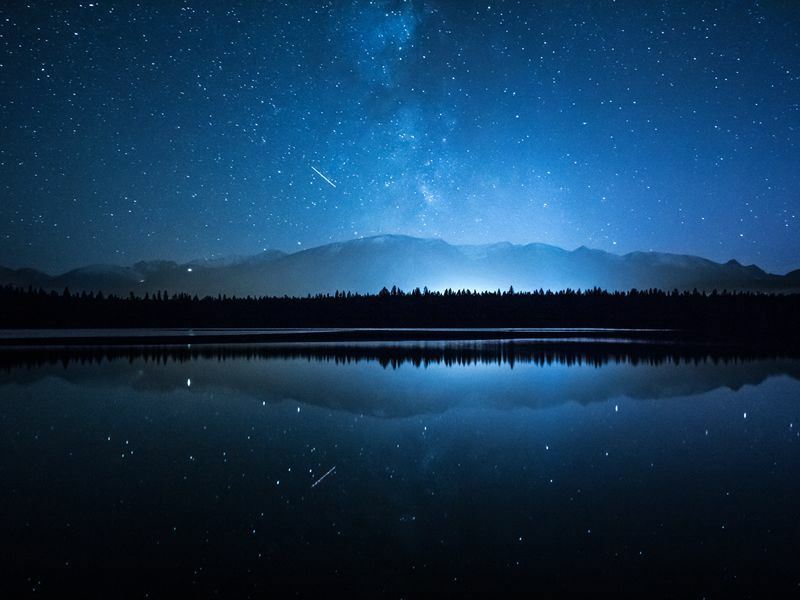 The Great Lakes aside and Canada boasts some equally spectacular lakeside alternatives with the western provinces of Alberta and British Columbia both sharing the undeniable freshwater highlights that are featured within the top 10 lakes in Canada listed below. 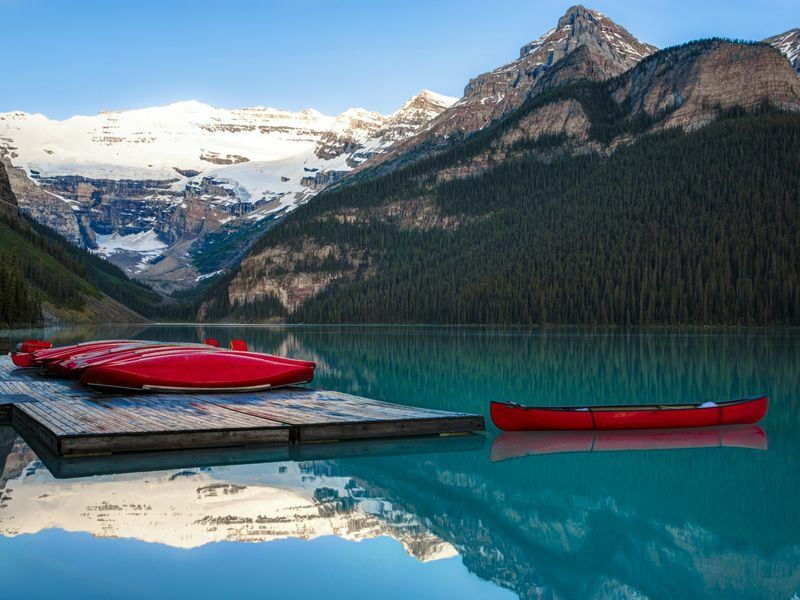 Kayak, canoe, water ski or simply sit and stare whilst contemplating life, the universe and everything, there is no finer place to do whatever you darn well feel like doing than by the side of a lake in Canada. 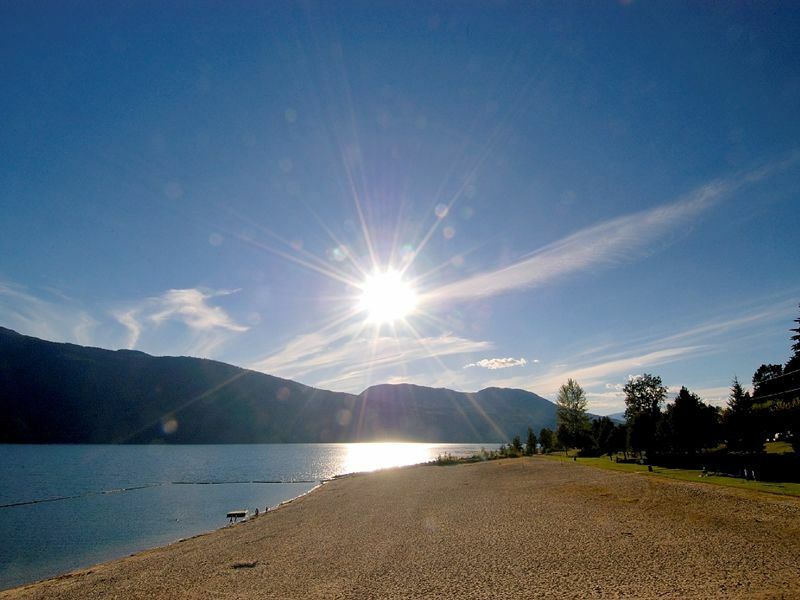 If you just so happen to find yourself in the south of BC then popping into the town of Osoyoos is always a great idea as not only is it close to the borders with Alberta and Washington state, it also has the warmest freshwater lake in Canada (Lake Osoyoos). However, it’s a slightly less busy stretch of water, just outside of Osoyoos, that should definitely be on your hit list and, although you can’t actually dive in, taking Highway 3 north is certainly an excellent option for all lovers of quirky nature photography. 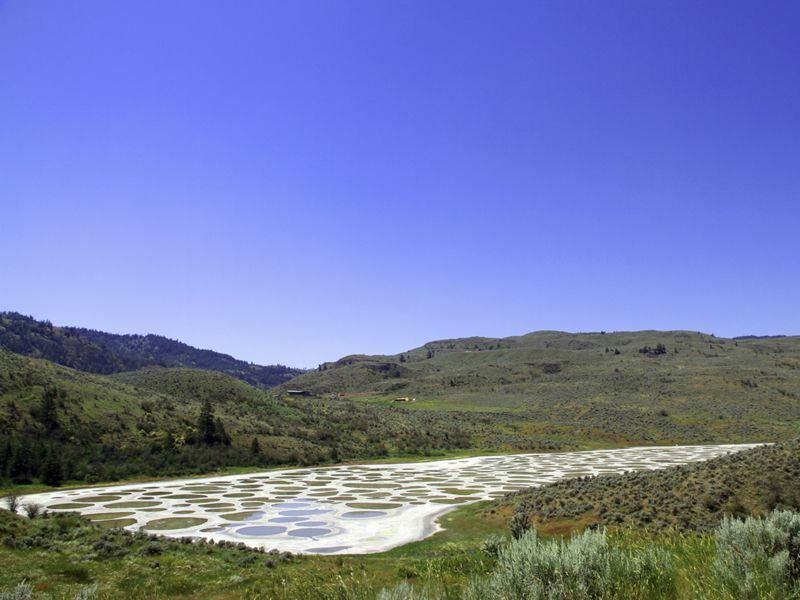 Spotted Lake certainly lives up to its name and from therapeutic mineral properties to some of the weirdest saline formations during the summer months, this is a unique lake experience that you won’t want to miss. Just over the border from BC you’ll find the province of Alberta which is home to, amongst many other things, Jasper National Park. Now Jasper is quite rightly mentioned in all important ski, snowboard and outdoor activity circles however, travel some 12 miles south of the town and you’ll discover the fabulous glacial waters of Medicine Lake which is certainly an excellent option for day trippers and wildlife watchers alike. Despite of the lake’s high altitude location there is an abundance of wildlife that make the shores their home with bears, moose and mule deer all commonly seen along the 4.3 mile stretch of lakeside. As Medicine Lake is fairly shallow it also attracts anglers of all kinds with eagles, osprey and fishermen all competing for the best spot to hook the lake’s more than plentiful supply of rainbow and brook trout. 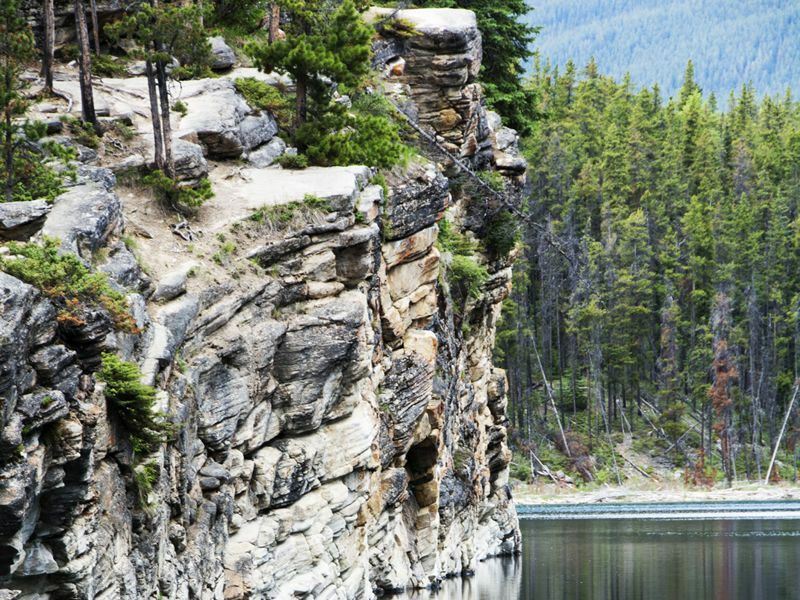 Another of Alberta’s and Jasper NP’s most beautiful lake locations comes in the guise of Horseshoe Lake which can be found approximately 25 miles south of the town to the east of the Icefields Parkway. This is a well-guarded local secret and considered to be one of the lesser-visited and best places to cool off during the summer with cliff jumping and kayaking both enjoyed despite of the freezing water temperatures. If you don’t fancy taking the plunge then Horseshoe is also known for having some excellent trails that follow the shore and provide some excellent opportunities to see the shimmering blue green colouration that makes this spot such a pleasure to experience first-hand. 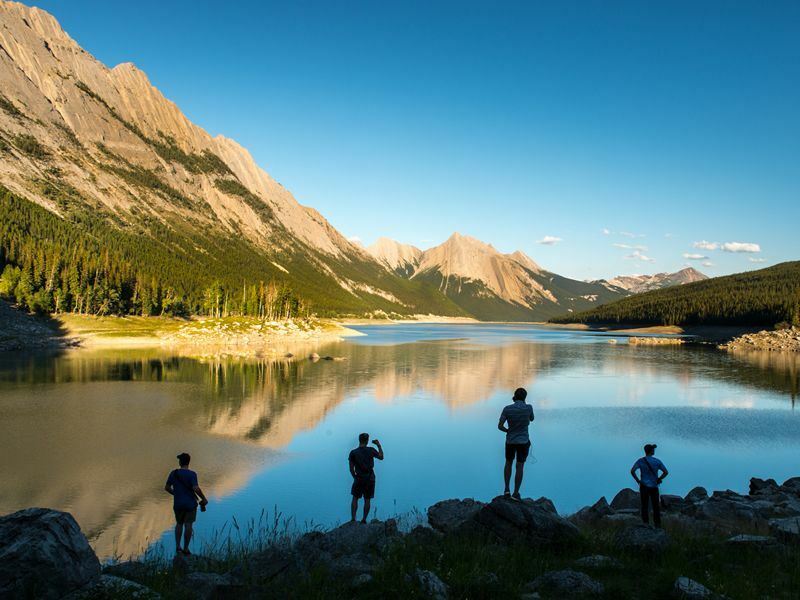 Another of Jasper’s well-kept secrets is Lake Annette which is hardly any distance at all from the town but provides one of the province’s most spectacular beach settings and the ideal spot to kick back and relax after a night spent kicking up your heels. Again, water temps are never going to be hot and you maybe pleased to hear that there are plenty of grassy hillsides and picnic sites to help you enjoy the glacial beauty from an altogether more warmer perspective. However, if you do steer yourself to take the plunge then water quality tests have marked Lake Annette as holding Green status which means that this lovely lady lake passes with flying colours practically 100% of the time. Although you won’t find much in the way of a day at the beach when visiting BC’s Upper Arrow Lake, you will find an incredible range of pine forest covered hillsides which more than allow for outdoor activities and plenty of shade during the summer months. As part of the Columbia River, the largest of its kind in the Pacific Northwest, this is a great chance to explore and trek with a couple of ferries helping you cross from shore to shore without too much difficulty. If you prefer boating of a more personal nature then Upper Arrow presents plenty of chances to do so with sheltered anchorages and facilitated marinas enabling you to stay afloat all summer long. Continued exploration through the incredible landscapes of British Columbia will finally take you into the Canadian share of the Rocky Mountains and in so doing you may just stumble across the awesome Yoho National Park. The name Yoho is Cree for awe and wonder which will no doubt whet your appetite for what you’ll find once you get out there and explore. 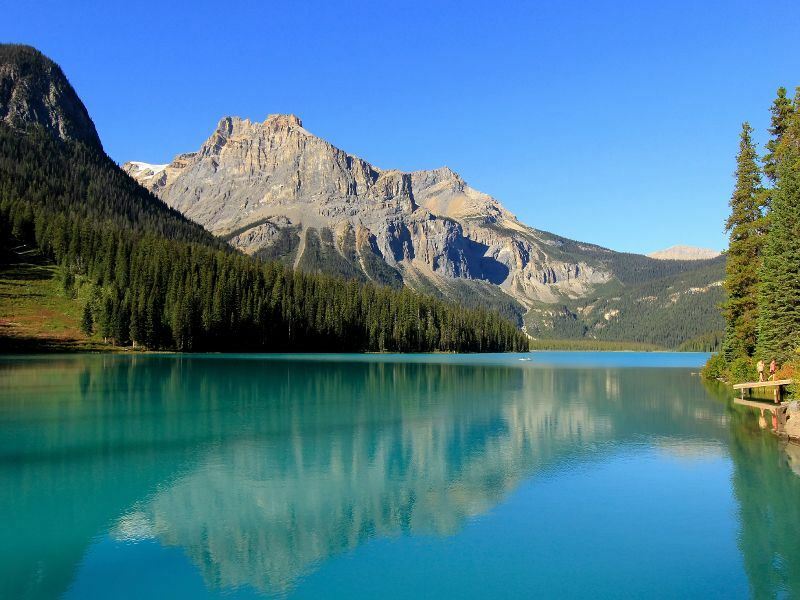 Whilst visiting Yoho it would be rude not to pay your respects to the park’s largest of 61 lakes, Emerald Lake. As with the Cree name for the park, Emerald Lake more than justifies the title and with more than 3 miles of hiking track surrounding the water you’ll find plenty of opportunities to take photographs juxtaposed against a beautiful green backdrop. Canoe, trek or just enjoy the reflections of the President mountain range, whatever you’re thinking of doing in Yoho, Emerald Lake is an excellent option no matter what the time of year. Another of Canada’s most celebrated national parks is Banff and if you’re into your ski or snowboarding then you’ll no doubt already of heard about the resorts and slopes which are such a magnet for lovers of the white stuff. 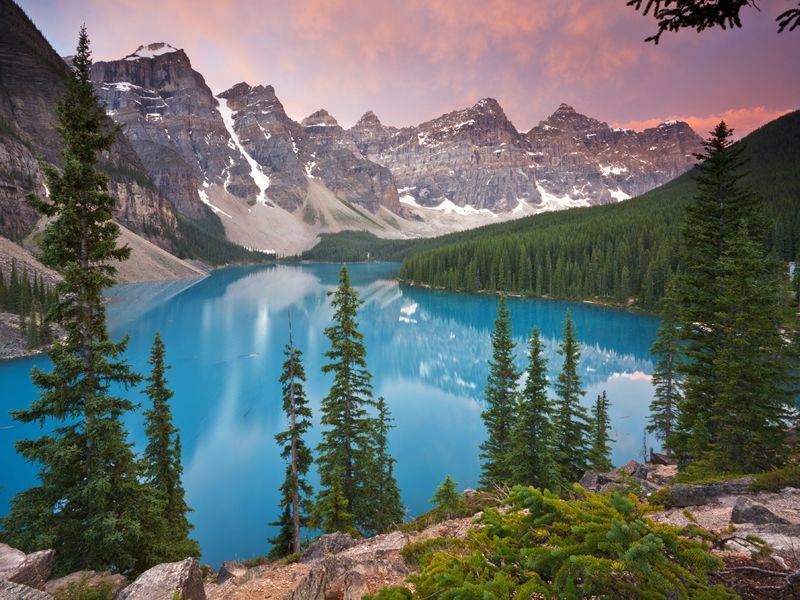 During the summer, when the thaw has really kicked in, is often considered to be an equally, if not better, time of year to visit and one such location that draws the crowds is the glacial water of Moraine Lake which lies around 9 miles outside of Lake Louise village. Numerous hiking paths will lead you around the lake and put your hiking boots to the test as you discover just how Lake Moraine got its name however, once you’ve scaled the surrounding heights all of that scrambling will be long forgotten as you kick back and enjoy the gorgeous blue hues far down in the valley below. 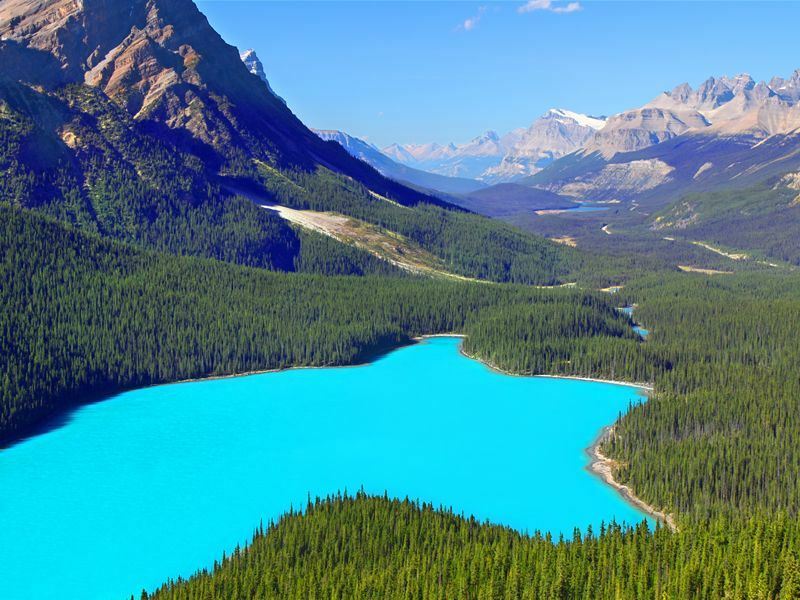 With some incredible colouration as well as more than its fair share of glacial mountain views, Maligne Lake in Alberta’s Jasper Park is one of the world’s most photographed natural places and always deserves to be around the top of any list relating to awesome stretches of water. 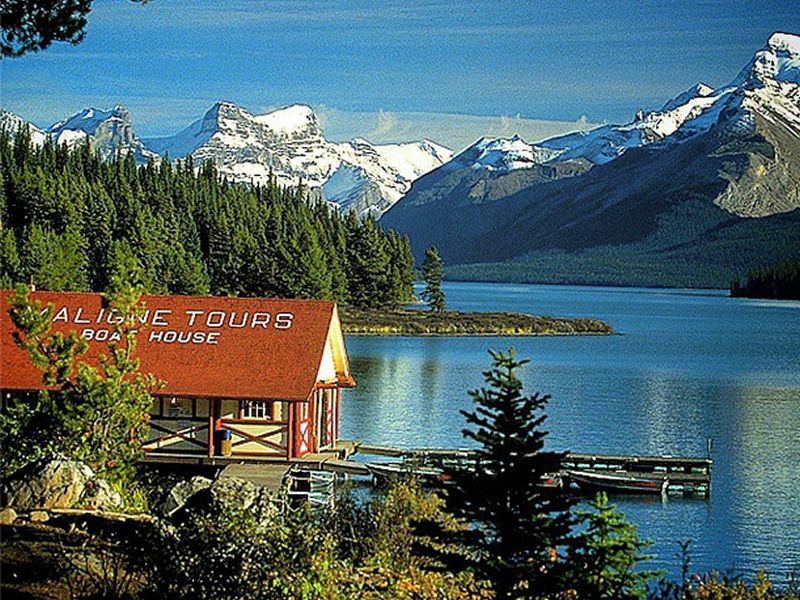 Situated about 30 miles south of the town of Jasper and providing the starting point for one of the national park’s most popular hiking trails (the Skyline), Maligne Lake is just one of those places that you can’t help returning to and visiting the tiny island of Spirit on a summer’s day is pretty much as good as it gets. Other activities to try before the winter takes hold include: kayaking, canoeing and fishing with a couple of main camping sites (canoe access only) providing an ideal base to keep you outdoors and active all season long. Another beautiful Banff lakeside setting can be found, yet again, on the awesome Icefields Parkway and if you’re looking for an amazing opportunity to blow your colleagues’ screen saver shots out of the water then Peyto is probably the place to find it. One of the best locations to get the ultimate photograph is from the highest point on Icefields Parkway, Bow Summit, which, although busy in the summer time, has an awesome viewing platform to help you snap away until your heart’s content. Best advice for avoiding the hordes arriving by the coach load is to set off from the Bow Summit car park and take one of the trails which leads up the mountain via a paved footpath which then turns into a gravel track and presents some incredible and lesser visited viewing points to make the chaps back home green with envy. Also known as the Lake of Little Fishes, Lake Louise is one of Alberta’s finest and definitely needs at least a whole day to truly appreciate the effortless beauty of its glacial waters. Although the lake’s surface area cover less than a square mile it does hold some quite remarkable trails around the edge with the likes of Big Beehive, Saddleback Pass and Devil’s Thumb all commanding legendary trekking status if you pay heed to the knowledgeable locals. If you prefer to explore on two wheels or even four legs you’ll find that several trails make way for bikes and horses although its often a kayak or canoe that will take you out onto the water and give you one of the grandest views from an entirely new perspective. Best view point: if you fancy a quick hands and feet scramble to the 9,000 foot summit of Fairview Mountain then you’ll be treated to an amazing view of Lake Louise far, far below.